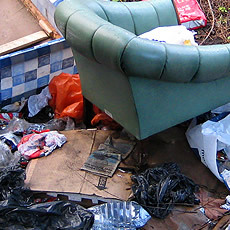 For a same day estimate / booking for removing your rubbish please fill in the form below. Remember you get an extra 10% off if you book online! All of our operatives are fully trained and have been vetted to make sure that they fit the bill, providing a friendly and efficient service that you’re sure to love. View more information. "Any Waste is a great company. They are willing to go that extra mile for their customers which really shows through their work. " "Any Waste safely disposed of some old furniture, including a bed and sofa. They were really efficient in completing the work and were professional throughout. Very impressed guys!"